Instant Replay Review confirmed 1B Umpire Jim Reynolds' out call in the bottom of the 4th inning of the Mariners-Athletics game. 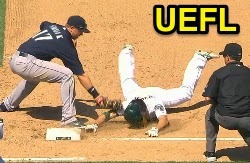 With one out and none on, Athletics batter Sam Fuld hit a 0-1 fastball from Mariners pitcher Erasmo Ramirez on a fly ball to center fielder Abraham Almonte, deflected to shortstop Brad Miller, who threw to first baseman Justim Smoak as Fuld dove back into first base after rounding the bag. Upon Instant Replay Review as the result of a challenge by Athletics Manager Bob Melvin, Reynolds' ruling that Smoak successfully tagged Fuld while he was off his base was affirmed, the call was correct. At the time of the review, the contest was tied, 3-3. The Athletics ultimately won the contest, 6-3. This is Jim Reynolds (77)'s first Instant Replay Review of 2014. Jim Reynolds is now 1/1 (1.000 Affirmation Rate) in Instant Replay Reviews during 2014. Crew Chief Fieldin Culbreth's crew is now 3/3 (1.000 Affirmation Rate) in Replay Reviews during 2014. This is the 44th Instant Replay Review of the 2014 MLB Regular Season. Athletics Manager Bob Melvin is now 0/3 (.000 Success) in Instant Replay Challenges/Reviews during 2014. Umpires are now 28/44 (.636 Affirmation Rate) in Instant Replay Reviews during the 2014 MLB season. This is another awful call confirmed by replay. Sham. The original call was safe so with or w/o replay he would still have been safe, 16 calls have been corrected so far, and it's just the first week, even if some replay rulings are botched, it's still worth it for those that are corrected. I just hate that there are no ejections... replay is killing to "feel" of baseball. Seriously. I don't know what these guys in NY are looking at, they must not be the same replays. Way too many of these are not being called correctly. What a shame. They actually aren't. From what I heard, they added their own cameras in the ballparks. They use the home and away feeds, plus the alternate angles that we don't have access to. Someone will argue the strike zone sooner or later.